Kettle are masters of minimalism. Their standard Crisps have plain but loud colours. This departure to the Baked low fat arena sees a similar approach, with a unique, if a little uninspiring ceramic dish with a smattering of content ingredients within. There is still a broad background colour, although it hints more towards pastel colours. Without transparent oil patches and plentiful seasoning powder, these Kettle Cooked Chips featured a firm, but subtle Crunch. They were not nearly as crispy and munchy as some in the kettle range, but that is not necessarily a criticism. As with all Kettle Chips Crisps, these were thick and meaty slices of fried potato. There were oil blisters, but most were fairly small, providing a bumpy surface. There colouring was an odd shade of pink, which was most interesting. These Kettle Chips did not need much of a Nose Plunge Test. 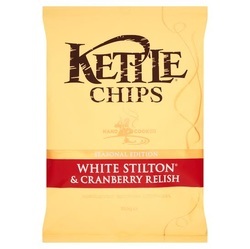 There was a thick and heavy aroma that was clearly cheesy, which you would probably expect from Stilton – these were just cheesy though, nothing particularly Stilton about them. The taste was similar really. There was a sweet backdrop, and it may have even been berry like, but to label it Cranberry would probably require a leap of faith. The Cheese was not Stilton, but it was Cheese. That said, this was a representation of the packet as a whole, the very heavily seasoned Crisps, did feature a flavour that was certainly Stilton like.